Beautiful, newly renovated condo with one Queen bedroom & ensuite 1/2 bath . Newly re- positioned Bunk beds are now inset into living room alcove for children or extra guests. Queen pull out bed from couch also.. Total capacity to sleep up to 6 people. All modern conveniences, cable and internet, fireplace, ground floor walk out for easy access. Walk across to pool area with clubhouse, gym and tennis courts. Short drive to Manchester for excellent shopping and many restaurants within 1-7 miles. Family activities all summer long on Bromley Mountain adventure park which is only a few minutes walk away. No matter what season it is, there is something for everyone. Check out the changing of the leaves in the Fall season, Ski fantastic slopes in winter and hike the mountain or hit the adventure park in summer. This is a year round facility. Family owned and operated for six years. Please check out our reviews. This condo has been exceptionally maintained. Its super clean and we are also pet friendly. If your animal is house trained, you're welcome to bring them along.We believe that the family dog is also a family member. We have been coming to Bromley for years, both in the winter to ski and summer to hike, we now share the joy with our kids who love it as much as we do. This area has something for every age. This is very much an all season destination. When we found our condo we knew that having the ground floor especially with young kids was a big selling point. Walking out onto the mountain side in any weather is such a delight. We had a great time at the condo. Enjoyed being right on the slopes. Owners were very helpful and responsive to questions. The condo is clean, well equipped and nicely located. It is only 15 min from Stratton and 15 min from Manchester. Bernie was excellent at responding to our text messages so quickly. The condo is cute and has all the amenities needed to make any stay comfortable. The bedroom has a queen size bed that was very comfortable. The pictures don’t do it justice. We found games, extra towels, pillows, and blankets. We enjoyed having a kitchen and being able to take our dogs with us was a huge plus. There was even a dog’s bed in the condo. We met some of the neighbors and they were so nice and helpful. We plan on going back and wouldn’t mind staying at this condo again. I run a business that allows me to work from anywhere, so I often travel for extended periods of time to get a real flavor for a place instead of just visiting for a few days. This year I wanted to spend a month in Vermont in the fall so it was important to me to have a functional, comfortable, centrally located home base I could work from while also being able to easily hit all the places I wanted to see in Vermont. 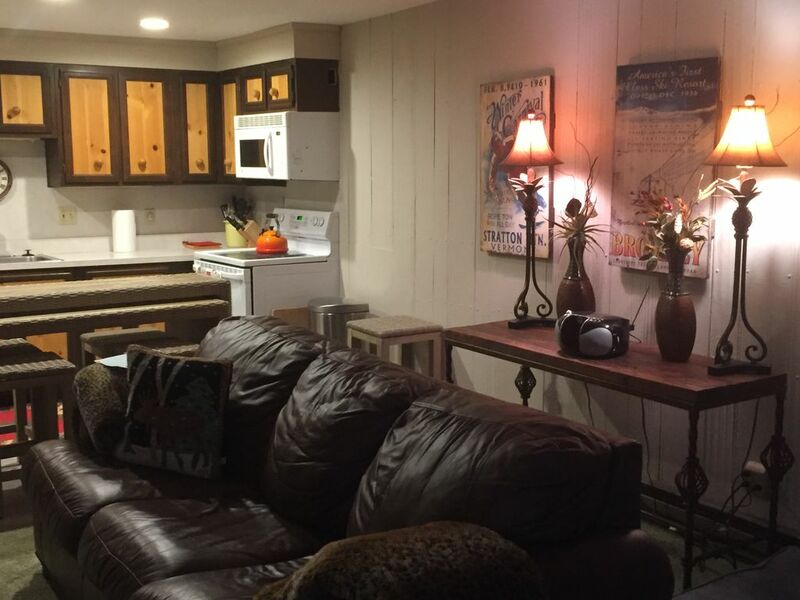 This condo hit all the marks - centrally located for road trips and also with plenty of small town charm (check out JJ Hapgood's general store on main street Peru! ), hiking and exploring within an easy 10-15 minute drive when I wanted to stay closer to home. Also had fast internet and wi-fi, a must for me, and the best - they happily welcomed my pup who is always along for the ride. An unexpected bonus was how friendly everyone on the mountain was - they were busy getting ready for ski season but always had a minute to wave hello and check in. When you're traveling by yourself it's those little moments that you notice and appreciate. Thank you Bernie and Joan and your families for your hospitality - it's a month I won't soon forget. Rented for the season and found the owners Joan and Bernie to be a pleasure to deal with. Unit was well maintained, comfy and the perfect place for us to hang our hat each weekend. It felt more like our personal hideaway than a rental unit. Came with our teen grandchildren.The condo was wonderfully stocked,cutely decorated and we immediately felt at home. The pool was nearby and the activities just down the road. Definitely would recommend this to others. My family recently rented this condo for a week to do some spring skiing at Bromley Mountain. We have rented numerous ski rentals in Vermont over the years and this place has got to be the best. The condo is absolutely gorgeous and is extremely well maintained and clean. The location is great and the unit is truly a ski in / ski out condo. We were able to bring our dog along which was a big bonus for us since she is part of our family and what is a family vacation without our dog. I honestly can not say enough good things about this condo. If you are looking for a place for a weekend getaway or a week long stay in the Bromley area this is definitely the perfect place. We are looking forward to renting it again in the future.